Did you know that all the taxes paid while souvenir shopping abroad can be claimed? Many stores in popular Mexican tourist destinations like the Riviera Maya and Cancun offer official invoices to claim purchases upon leaving the country. 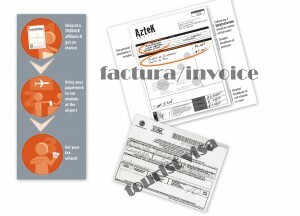 In Spanish, the invoice is called a factura, pronounced like (fact\tour\a) and it is relatively standard for store clerks to ask if you would like one upon making a purchase. So, keep all receipts and credit card slips organized with the invoices to claim taxes paid and regain some cash. Always ask for an invoice. Keep all invoices, receipts and credit card slips together and well organized. Make a copy of your tourist visa before going to the airport. This visa is referred to as the FMM and is the small slip of white paper that is stamped upon entering the country. Know and have your bank account information readily available in which you would like your refund deposited. Allow yourself plenty of time to visit the Tax Back booth and arrive to the airport early. Have your passport and boarding pass ready along with all official invoices, credit card slips and receipts. Depending on the airport, the location of the tax back booth varies. So, research to determine in which terminal the booths are located. Provided these steps and tips are followed, the procedure will be painless. 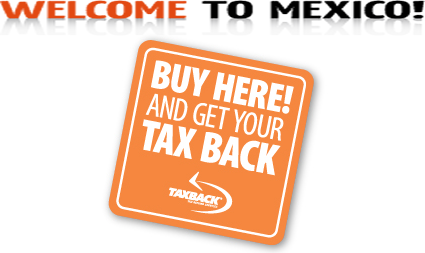 For those of you visiting Quintana Roo, the Cancun International airport has Tax Back booths located in Terminals one and three and if you have to stop over in Mexico City, booths can be found in terminals one and two. Other things to keep in mind are that refunds will take at least forty days and in order to claim your purchases, you must have spent at least 1,2000 Mexican pesos. Any accumulated or single purchase claims of 5,000 Mexican pesos or more will require you to show the item or items. Happy shopping, safe travels and buen viaje!